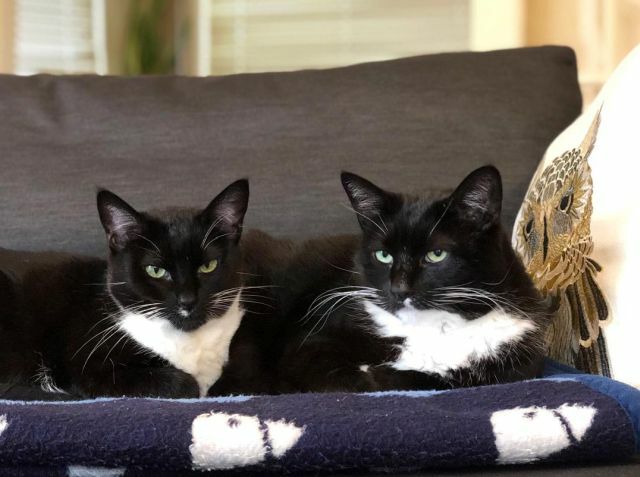 Edy & Suzy are a bonded pair of female tuxedo cats, roughly 10 years old. Edy is mother to Suzy. They spend nearly every moment together, even cramming themselves into the same tiny bed. They love to be with their humans as much as possible, whether it's joining them on the sofa or snuggling in bed at night. Suzy is the smaller of the two and definitely the boss. She's very affectionate with humans and will let you know when she wants attention by rolling around on the floor and making funny sounds. Edy is a big, cautious cat who's shy at first but also incredibly affectionate. She loves to snuggle with her humans when they are lying down. Big dogs tend to scare them, but Edy and Suzy have lived with two small dogs for the past few years and don't mind their company. They are also good with children. They'd love to find a home where their humans can spend a lot of time with them and enjoy their cuddles! Edy and Suzy are vaccinated, tested negative for FIV and Feline Leukemia, and are microchipped.